Other accommodation options nearby to the Prom can be found here. 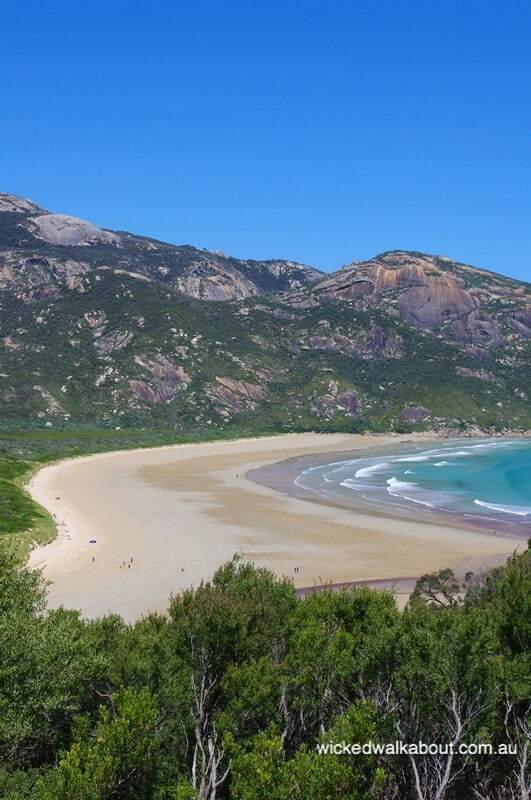 Wilsons Promontory is a stunning destination at any time of the year. During peak season, booking a campsite is by ballot. Anyone arriving during the Christmas/New Year or Easter periods, without a reserved site or cabin, will almost certainly have to head back out again as there would be very little chance of being able to find accommodation. Visit the Prom during quieter times though, and the scene is totally different. Even in winter, it is a brilliant place to visit and explore, this trip was late winter and the weather was superb. An alternative to camping out is to use the Cabins or Wilderness Lodge Tents – Glamping in style! These are ready set up and rather swish! 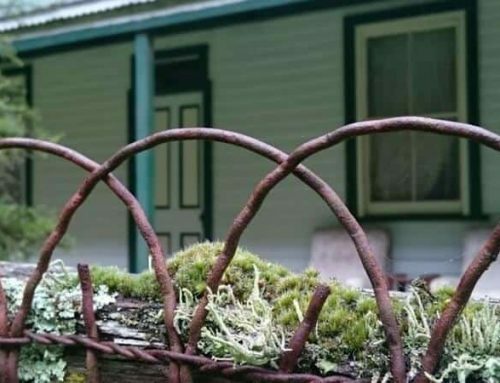 Book Accommodation on Wilsons Prom via Parks Victoria. We hitched the camper trailer, plus packed the Kombi Van Tent, and headed off early morning towards Wilsons Prom, heading down the South Gippsland highway and then turning off towards the Prom via the sweet little towns of Loch, Korrumburra, Meeniyan and Fish Creek etc. Our plan was to stay the first night at Bear Gully, in the Cape Liptrap Coastal Park. A great little spot on the coast that used to offer free camping with basic toilet facilities. 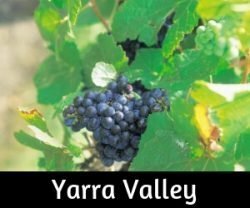 The rumour that Parks Victoria intended to start charging for many of the free camp areas in Victoria had come to fruition and it now costs about $34 per night – no powered sites. The ‘user pays’ method is fine, the bonus is that a site can be booked ahead of time and campers then know that they have a spot. When it was free to camp it did mean pot luck as to whether a site would be available as a number of people used to set up camp and stay for weeks on end, limiting availability for others. 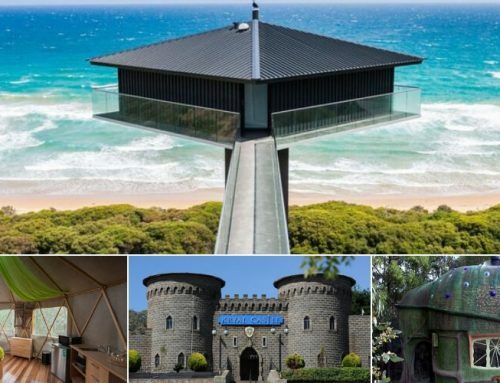 The sites can have a maximum of 6 people on each one, better for groups but a financial disadvantage for a single camper… Bookings for Cape Liptrap Coastal Park/Bear Gully and other Parks Victoria managed sites need to be done online. 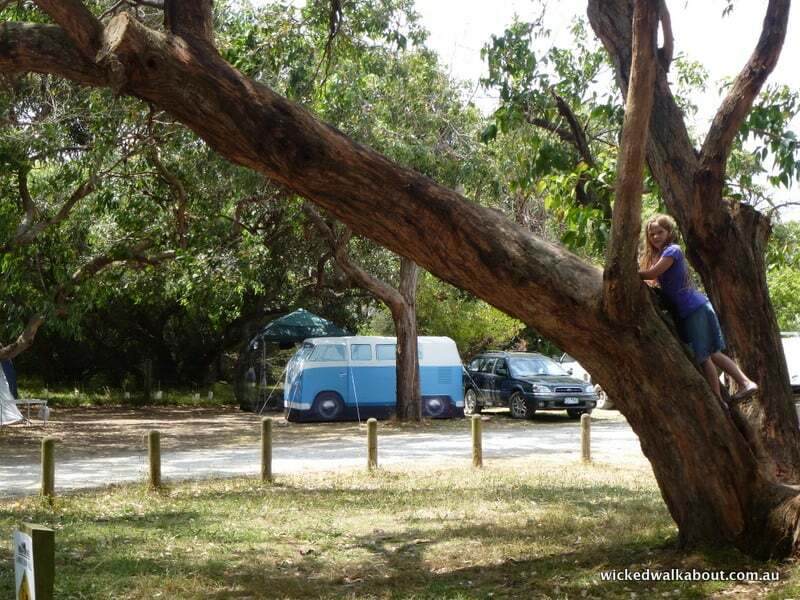 Bear Gully Camp Ground – our smashing Kombi Camper Van Tent set up and the kids out climbing trees! No wi-fi down here! 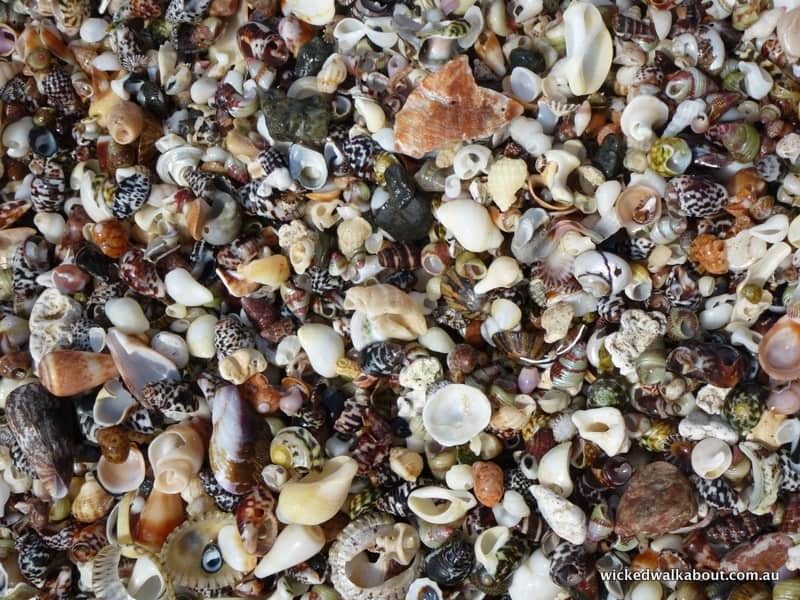 Beach at Bear Gully – A small patch of gorgeous shells. Long walks around the coast in either direction from the campsite can be done when the tide is not too high. 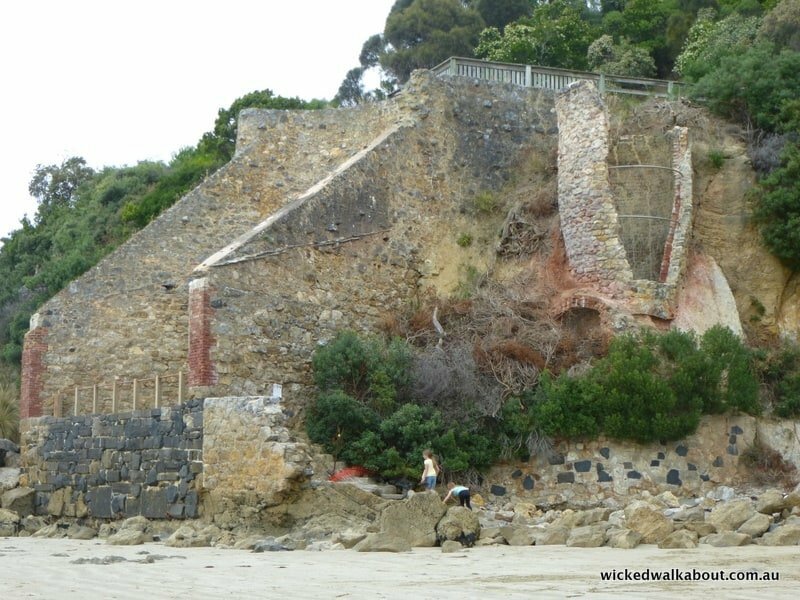 A short walk along the beach at nearby Walkerville and you will find giant brick buttresses protruding from the cliffs like the ruins of some ancient Roman engineering works. 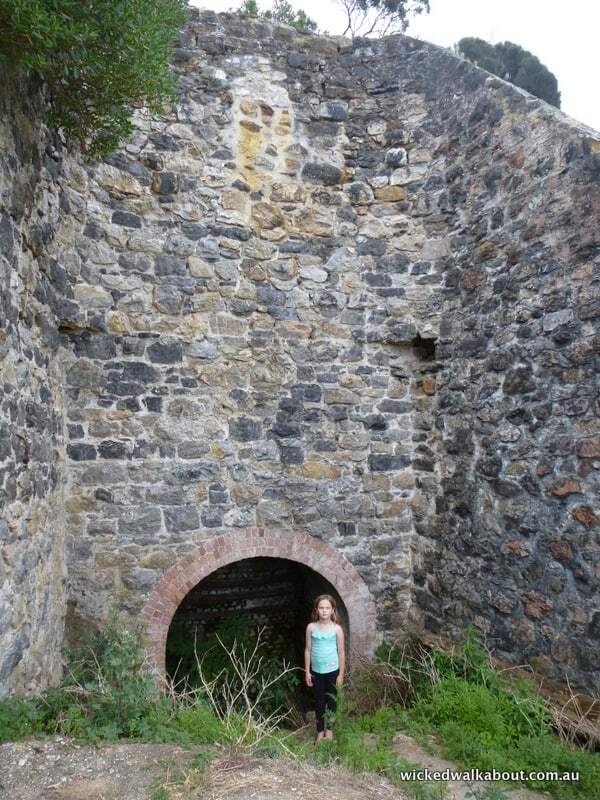 These are all that remain of the Walkerville lime kilns. Limestone mined from the cliffs was burnt with firewood in brick-lined kilns to produce quicklime. The lime was then bagged and hauled in tram carts along a 350-metre jetty which once stretched out into the bay to ships, bound for the city. Old Limestone Kilns at nearby Walkerville South. Next stop Waratah Bay, about 20minutes drive away. A quiet little spot with mostly holiday homes and a pleasant caravan park perched on the hill overlooking the bay with views across to Wilsons Promontory. 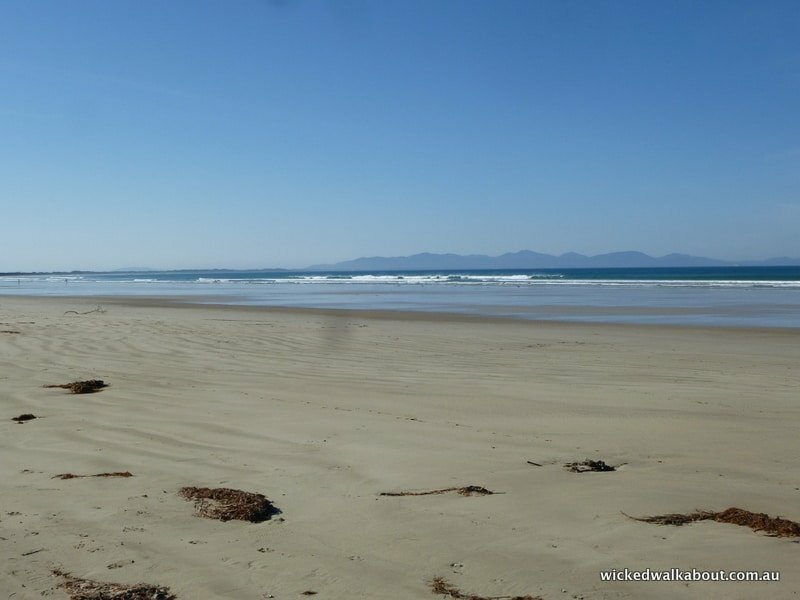 We spent a day fossicking on the beach at Waratah Bay with friends and then popped over to nearby Sandy Point and a great little Fishing spot called Shallow Inlet. A favourite place for the girls as they love playing on the sand dunes and go searching for crabs. 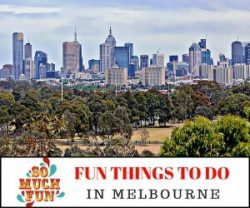 Some great walking around the sand dunes here or surfing at Sandy Point surf beach. Koalas can often be found here too and we were lucky to find an incredibly chilled out male in a tree at the Shallow Inlet entry road. There are 2 villas on this beautiful 4-acre property. Looking onto farmland and surrounded by vegetation local to the area. A resident male koala regularly visits along with lots of birds of birds. Shallow inlet is accessible by road or a 1.5km walking/ bike riding track. The inlet is a great place to spend the day fishing, swimming, boating or sailboarding with car access onto the beach. The surf beach track is about a 1km walk. 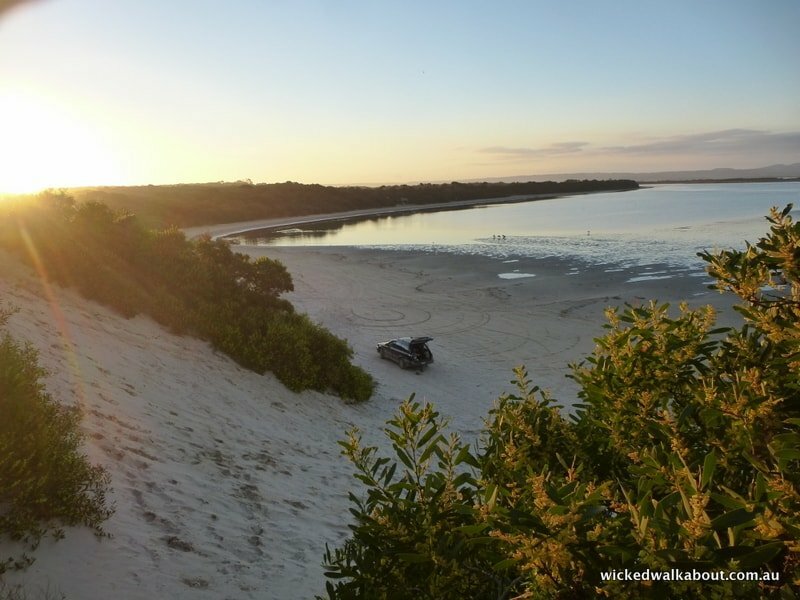 A short will take you to the main Sandy Point Beach. The beach is stunning and an ideal place for families to swim, surf and boogy board or just for lazing around. Opposite the main beach is the General Store, Café, Mini Golf and Tennis Courts. 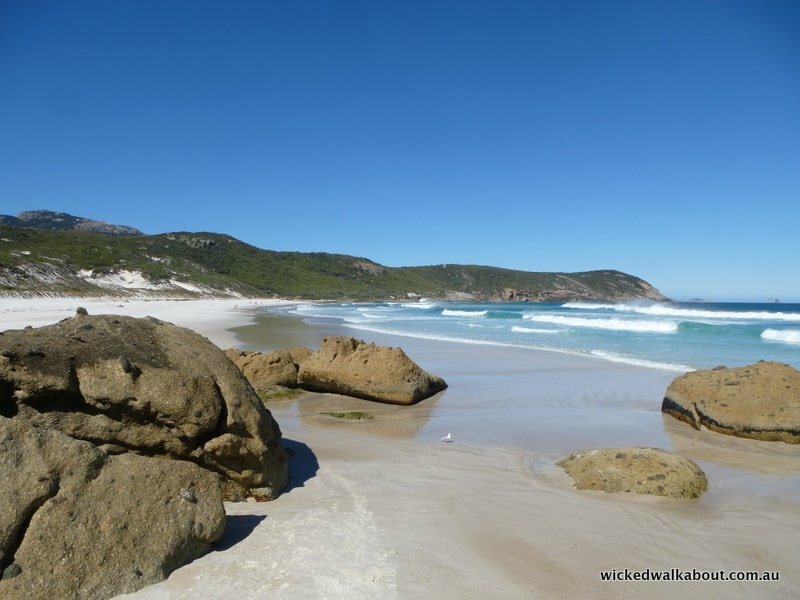 Wilsons Promontory is a 40 minute drive and has stunning beaches, walks and wildlife. 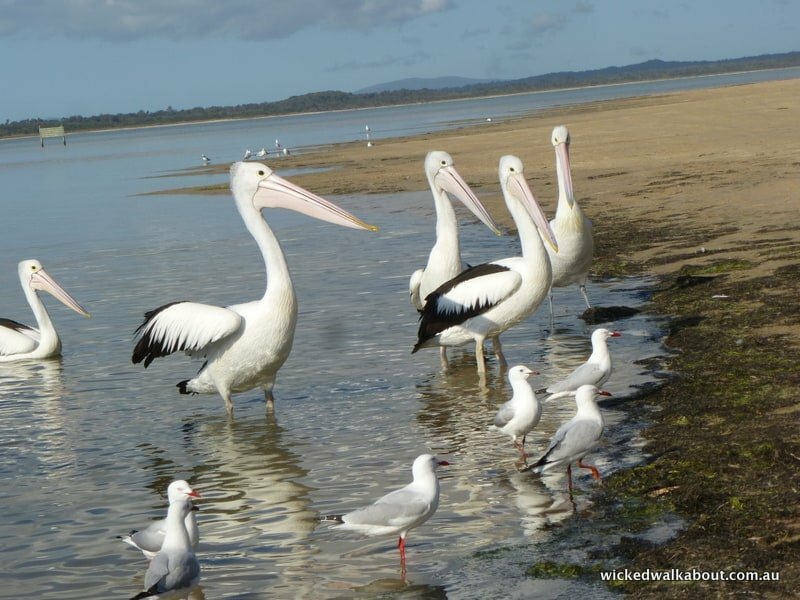 Pelicans and Seagulls waiting for scraps from a local fisherman at Shallow Inlet. 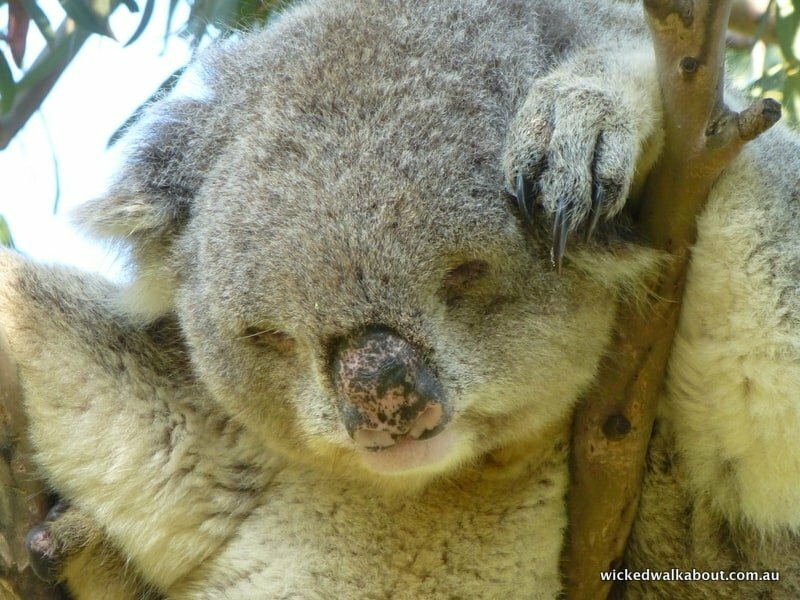 Totally Chilled Koala in a Manna Gum tree beside the road into Shallow Inlet! Shallow Inlet Beach… a BBQ by the beach (Australia is full of free to use or coin operated public BBQ’s) …sand dunes and Wilson’s Prom in the distance. 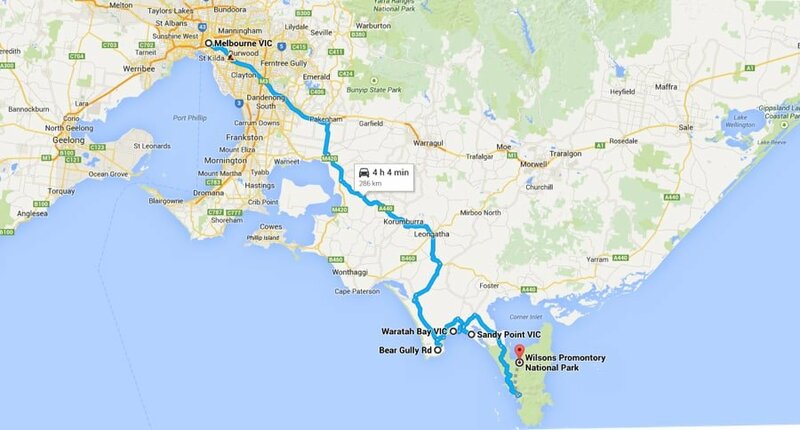 A 45 minute drive around the top end of Shallow Inlet and we are at Wilsons Promontory! The park entrance is 45km’s from the actual hub of activity on the Prom. Tidal River, where the camping and cabins are located, is the main centre with a general shop and petrol station. Hiking permits can be obtained if you plan to hike any of the overnight trails and camp out (in fine weather a lightweight hammock would be fantastic). 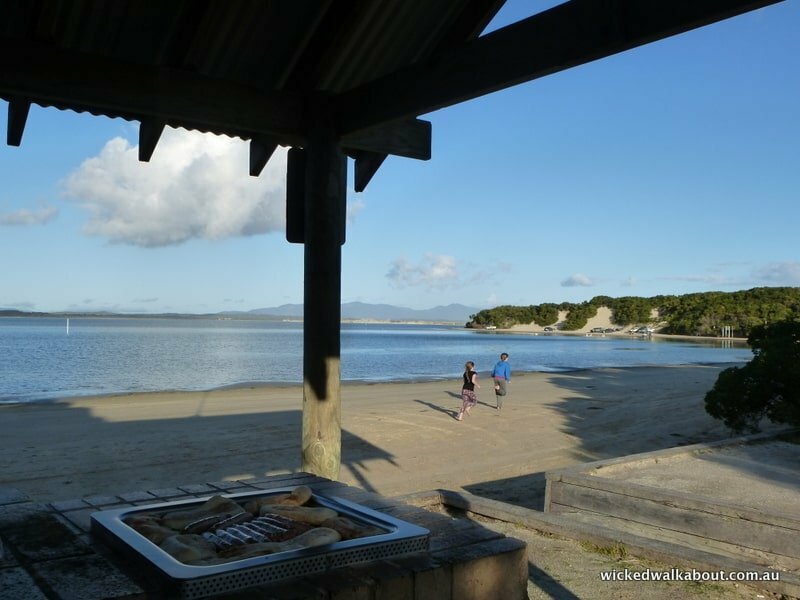 Free BBQ’s can be used by campers and day trippers at Tidal River and it has access to the beach. 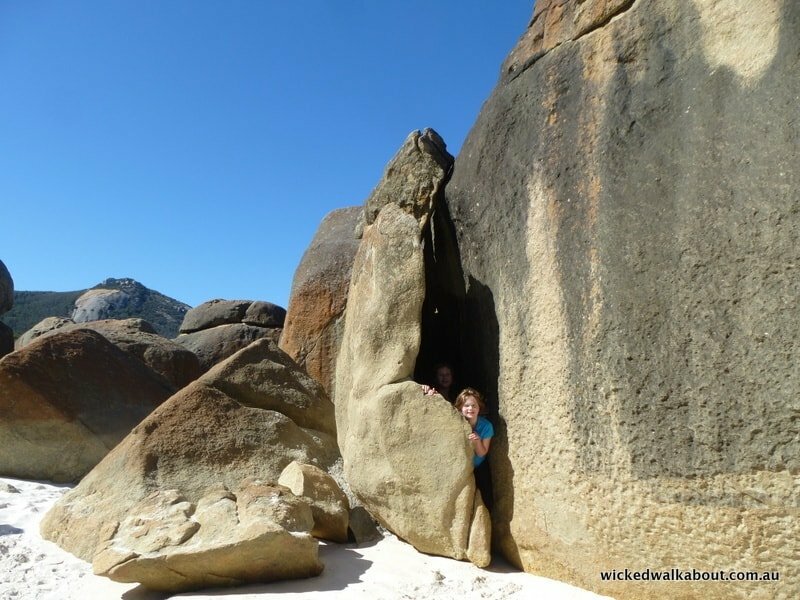 Hikes to famous spots such as Squeaky Beach, Lilly Pilly Gully and Mount Oberon are high on the agenda of most visitors. Camping, Glamping and cabins can be found on the Prom as well as properties just outside the National Park. Find accommodation options here. Why does sand squeak when you walk on it? It only occurs when a certain type of sand (e.g. silica), with grains of a certain size, create layers from the wind and moisture. The sand also needs to be well weathered, smooth and fairly rounded. Squeaky Beach – one of the many highlights of the Prom. Fabulous rocks to play on! 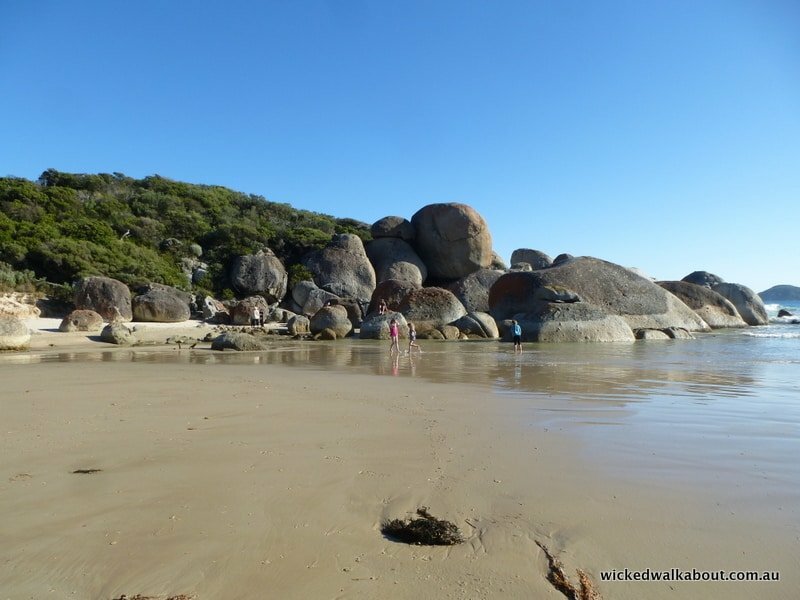 Squeaky Beach is a kids paradise! Looking along Squeaky Beach. The hike from Tidal River accesses the beach from the far end. Whisky Bay – especially good at low tide when it is possible to explore the rocks and caves. Wildlife on Wilsons Promontory will often appear unexpectedly, like this loveable Wombat who wandered on through when we were having our BBQ lunch at Tidal River. Campers are warned not to leave food around or inside tents as wombats will go for almost anything edible! A multitude of birds can be spotted in the area, including Emus – watch out for flocks during the drive to the Prom! This was a welcomed trip away and we took four days, but the Prom deserves more time to see it all and visit the numerous other areas along the way. 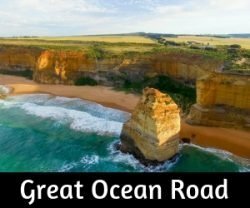 Philip Island and the Little Penguins is a good addition to the trip if time permits, quite easy to drive to Phillip Island then continue on the South Gippsland Highway to re-connect with the road to the Prom. Ideally, 7-10 days would be easy to fill with adventure down this way. 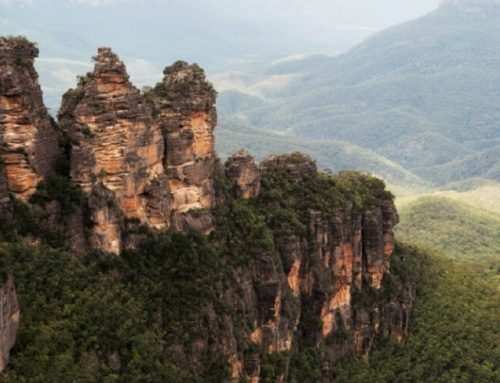 For travellers heading up or down the coast from New South Wales, it is a diversion well worth adding to the list! Some great photos, especially loved the pelicans and koala. Never having been to Australia they look pretty exotic. Some of the landscapes remind me a lot of South Africa where we’ve spent the last 3 months. Gorgeous. You need to get on over here to visit Frank! Do you have any thoughts or plans to come to Oz? though I’ve been to Melbourne I’ve never heard of Wilson’s Promontory. So jealous you saw a wombat. From your description they sound like the Australian equivalent of the raccoons we have in the States: They’re always looking for any food that they can pilfer from campers! You will have to come back to see Wilson’s Prom and the wombats Linda! I have never failed to see them down there. 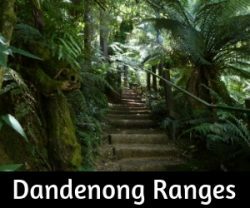 We have one that marauds around our garden each night here in the Dandenong Ranges… but have not seen him – just the dug up paths where he fossicks for food… too gorgeous!Oh, and if you do come back down under… email me!